The morning began as usual in the Argonauts agency - quiet and steady. Jason and Medea finished breakfast and got ready to get on with their daily business. Suddenly, someone opened the front door. At the threshold stood a bearded man who seemed to be very happy about something. Medea's uncle Pelias came to visit. He's a famous artifact collector. He had a favor to ask Jason and Medea. They have to go meet a cetain antiques specialist and pick up a package ro Pelias. 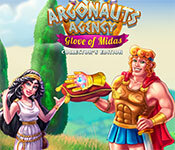 This game has a free trial version, click to start Argonauts Agency: Glove of Midas Collector's Edition Free Download. If you like it, please buy the full version to support the developer, thanks.